Delegates of the IFJ meeting at the 29th World Congress in Angers elected Philippe Leruth, member of the Belgian Association générale des Journalistes Professionnels de Belgique (AGJPB) as the president on June 9. Journalist at the daily newspaper L’Avenir, Leruth was vice-president of the European Federation of Journalists (EFJ), the European group of the IFJ, from 2004 to 2013, and AGJPB president from 1995 to 2005. “The first challenge I will have to restore is IFJ unity,” said the newly elected president. He is taking over from departing British President, Jim Boumelha, who headed the IFJ from 2007 to 2016 and was elected the honorary treasurer. Other elected members include Morocco’s Younes M’Jahed (Senior Vice-President), Sabina Inderjit (India) and Joachim Krebich (Germany) as vice-presidents. Read the full list of the new IFJ executive committee here. The Digital Campaigning for Media Action: A Campaign Guide for Journalists [download] was launched on May 23. It outlines the essentials of the digital campaigning utilizing social media platforms. 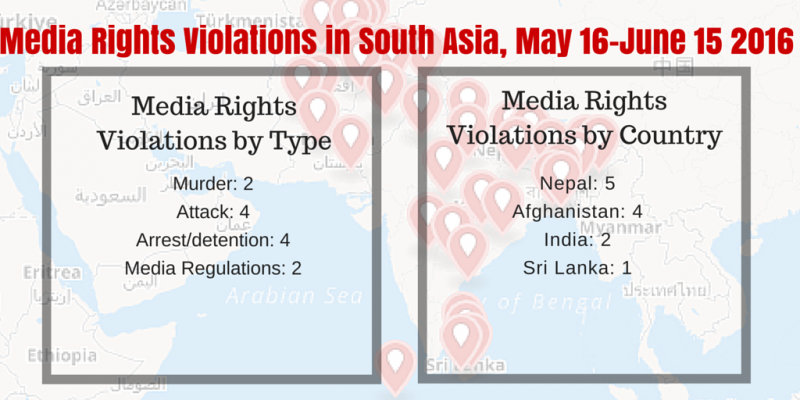 On May 25, the report on the Survey on Digital Security in South Asia’s Media [download], conducted with 176 journalists in all eight countries of South Asia, was launched. 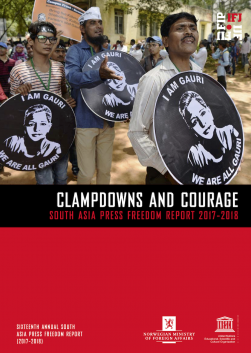 And on May 31, Breaking the Walls: The Fight for Freedom of Expression in the Digital Space in South Asia [download] was launched. It is an assessment of the state? freedom of expression in South Asia on digital platforms. All SAMSN members shared messages of basic digital security and social media postcards? through their social media platforms and email mailing lists to raise awareness among journalists. Read more about the campaign here and here. For reports and other resources, click here. Zabibullah Tamanna, a local fixer/interpreter, and David Gilkey, an American photojournalist with the National Public Radio (NPR), both embedded with the Afghan Special Forces, were killed on June 5 when the armored vehicle in a convoy they were travelling in was struck by an 82mm rocket in a Taliban ambush near Marjah in Helmand. The vehicle carrying Gilkey and Tamanna was destroyed and their bodies were only recovered following heavy firefight[?]. Gilkey, 50, was an award-winning journalist who had extensive experience covering conflicts in Gaza, South Africa, Iraq, the Balkans and Afghanistan. Tamanna was a freelance journalist who worked for NPR as well as the NBC News and Turkey’s Anadolu News Agency. He had also worked with Chinese news agency Xinhua as a photojournalist. More here. After protests from IFJ affiliates NPU and FNJ along with other media outlets demanding immediate withdrawal, the Minister for Information and Communication, in a meeting with FNJ delegates, agreed to review the Directives on June 21. More here. 5. What happened to Zeenat Shahzadi? Zeenat Shahzadi, a journalist for the Daily Nai Khabar and Metro News in Lahore, disappeared on her way to work in an auto-rickshaw in August, 2015. Police are understood to have registered a case against ‘unknown men’, but to date no developments have been made public. Zeenat’s family alleges that she was targeted by Pakistan’s Special Forces for her reporting. The IFJ and its affiliate the Pakistan Federal Union of Journalists (PFUJ) have been aware of the case since October 2015 but at the request of the family did not make the case public. According to reports, Zeenat’s older brother Latif said that prior to her disappearance, Zeenat had been investigating another disappearance – that of Indian engineer Hamid Ansari. Ansari went missing in November 2012, after he entered Pakistan illegally. More here. Freddy Gamage, the editor of Meepura, a regional web portal, was attacked by two unidentified assailants while walking to his car after covering the monthly meeting of the Negambo Municipal Council on June 2 in eastern Sri Lanka. He was hospitalized after the attack, during which he received a head injury. Gamage, who is also the Convener of the Web Journalists’ Association, said he had received threats from Dayan Lanza, the Deputy Mayor of Negombo, who had warned him not to write negatively about him and his brother, Nimal Lanza, a Sri Lanka Member of Parliament. More here. On June 17, Deputy Inspector General (DIG) Ranjith Perera, the head of the Police Department’s commando arm, publicly threatened to punish journalists for not giving enough media coverage to his efforts to crack down on narcotics being smuggled. His outburst was captured on reporters’ audio tapes in a news conference organized by the police in Colombo. Perera continued by warning journalists that he knew how to control the media and would do so by punishing journalists the same way his outfit had “controlled and suppressed the underworld.” He identified several journalists by name and accused them of not giving him enough publicity and suggested that they could face dire consequences. Later, Police Senior Superintendent Ajith Rohana apologized to the media on behalf of the Inspector General of Police and said that an inquiry against DIG Perera would be held. More heremore. An unknown group planted improvised explosive devices (IED) on the roof of the radio station and cable TV network offices in Nangarhar province on June 8. The explosion damaged the transmission equipment, causing transmission to be halted. No one was injured in the incident. Zaman Suhil, the program manager of Enekas Radio, said that three bombs were placed on top of station building. After the attack, a fourth bomb was defused by the security forces. Engineer Zulmay, who established the radio station in 2001, said that he had received threats from local Taliban and ISIS groups over the past few months. Police are investigating the incident. More here. Naimatullah Karyab, a local correspondent for BBC and provincial head for Kunar province at AIJA was arrested by the US force in Jalalabad province on May 28 and handed over to the National Security Agency. During the detention, he was searched, and his communication equipment was seized. He was released after three days with security forces claiming that he was confused for another person with same surname. More here. Shesh Narayan Jha, the chief editor of news portal Sahayatra and the managing editor of the Samayabodh magazine was arrested for photographing a protester in Kathmandu on May 23. 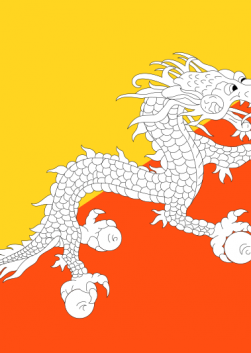 The protestor was smearing paint on the wall of Singha Durbar, a main government complex. Jha was charged under the Public Offence Act along with the protester. In a separate incident on May 23, Chandra Man Shrestha of newspaper Nepal Sandesh was arrested following an article he authored, which allegedly included ‘false news’ about parliamentarian Gagan Thapa. Nepal Sandesh issued an apology to Thapa regarding the article. Shrestha was arrested under the Electronic Transaction Act (ETA) and remains in police custody. More here. Bhanubhakta Niraula, the managing director of Himal FM, was attacked by Buddhi Kumar Rajbhandari, the co-ordinator of the Local Peace Committee, on June 9 on the premises of the District Administration Office Solukhumbu in eastern Nepal. Rajbhandari reportedly started threatening Niraula and tried to assault him when he saw him, asking why he had published news about the Committee. The attacker threatened Niraula not to broadcast any news about the Committee and its work. More here. Asianet News senior reporter, Shyam Kumar, Reporter and TV scribe, Sreejith, and City channel’s cameraperson, Anoop, were attacked on June 14, reportedly by the cadres of the ruling Bharatiya Janata Party (BJP), as they tried to record footage of three BJP workers who were brought to the judicial first class magistrate court. The BJP workers were being presented in the court in connection with their involvement in political clashes. The journalists were manhandled, while the attackers also damaged their cameras. Police were present when the journalists were attacked and walked away without intervening. Asianet News said that the attackers also threatened the journalists. More here. The National Investigation Agency (NIA) asked some local newspapers in Imphal, Manipur to produce the photo copy of the press statement with its e-mails header, that had been sent by the CorCom, an underground outfit ?. In an order signed by an Inspector, NIA said the production of the press statement photo copy with e-mail header was necessary or desirable for the purpose its investigation. More here. These provisions have obviously empowered the State agency’s arbitrary power of censorship. The Department of Information is the State agency where the online media should be registered and renewed, says the Directives. And if any media fails to get renewed within stipulated time, it shall be blocked as the Directive states. Read more. The free flow of information in the internet has empowered journalists and threatened entrenched powers. Perhaps in response, journalists and whistleblowers now face renewed threats from both state and non-state actors. In the face of these threats, it is important for journalists to protect the safe digital space that is so vital to carry out their jobs – pursuing leads, engaging in investigative journalism, and protecting the confidentiality of their sources. Read more. The prime suspect in the murder of bloggers Avijit Roy and Niladri Chattopadhyay Niloy was killed in a “gunfight” with detectives in Khilgaon of Dhaka on June 19. Deceased Shariful alias Sakib alias Sharif alias Saleh alias Arif alias Hadi-1 was a top organiser of banned militant group Ansarullah Bangla Team (ABT), a banned outfit which was behind the killing of bloggers. Morehere. Following prolonged talks with the Bangladesh government, Facebook, Google and Microsoft have all agreed to do more to remove ‘inappropriate content’ from the internet. State Minister for Telecoms, Tarana Halim, said: “After intense discussion with Facebook, Google and Microsoft, it has been agreed that they will respond to requests within 48 hours“. More here. After months of nationwide consultations, Afghan journalists approved the National Code of Ethics on May 25, which is intended to promote the highest quality of work and to ensure the independence and accountability of journalists and media organizations. More here. Five of Pakistan’s biggest press clubs and other platforms including four regional and a central union of journalists in partnership with Pakistan Press Club Safety Hubs Network has set minimum benchmarks for the safety of news-providers across the country, demanding special legislation from federal and provincial governments to protect journalists facing increasing threats to their lives, families and media houses. More here. 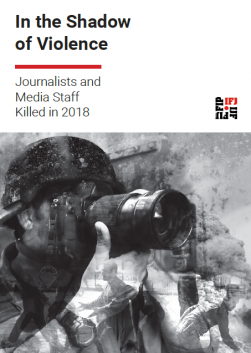 When stringers are attacked or killed, the struggle for justice begins with determining whether they are journalists at all. More here.